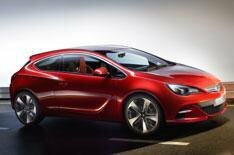 Vauxhall reveals GTC Paris Concept | What Car? This is the Vauxhall GTC Paris Concept, which will make its debut at the Paris motor show later this month. The car maker has suggested that a production version 'will not stray far' from the concept car and that it will retain the GTC name for the production car. The concept car is powered by a 2.0-litre turbocharged petrol engine with a start-stop system and is mated to a six-speed manual gearbox. > GTC Paris C/cept: click to enlargeIt's fitted with a limited slip differential and an updated version of Vauxhall's Flexride adaptive shock absorber system. Despite looking production-ready, the three-door Astra is at least a year away from going on sale.